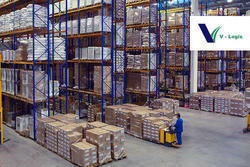 V-Logis offers total Logistics solutions that include transportation, warehousing and distribution. With more than 3,00,000 sq.ft. of warehousing space across the country and efficient, safe handling of goods throughout the service chain, makes this service viable for customers who would like to outsource their inventory management, and concentrate on their core business activity.